In a small house tucked away inside Sangam Vihar, a large low-income colony in South Delhi, lives 21-year-old Sunita. Along with a brother and two sisters, the four siblings share this house with their parents—both members of the capital city’s working class. Her family brings in an annual income of less than one lakh rupees. 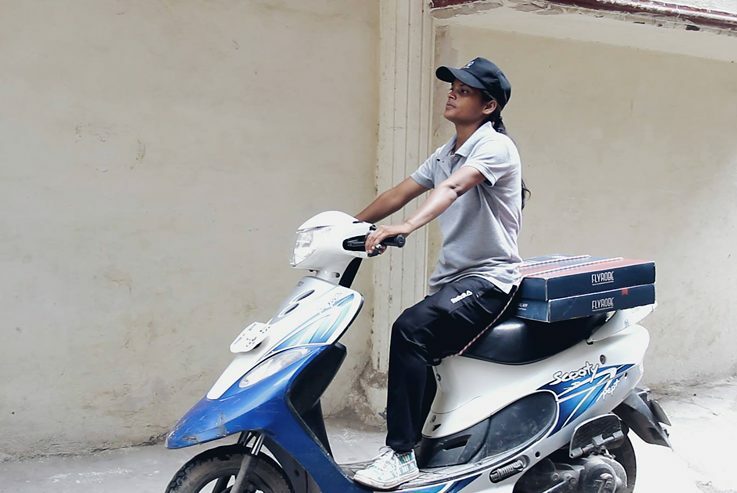 Nine months ago, Sunita joined the one-year-old logistics start-up Even Cargo as a scooter-riding delivery girl—a primarily male-dominated profession in India. “My brother taught me how to ride a cycle, and the scooter just came naturally after that!” she exclaims, a helmet secured tightly around her head. 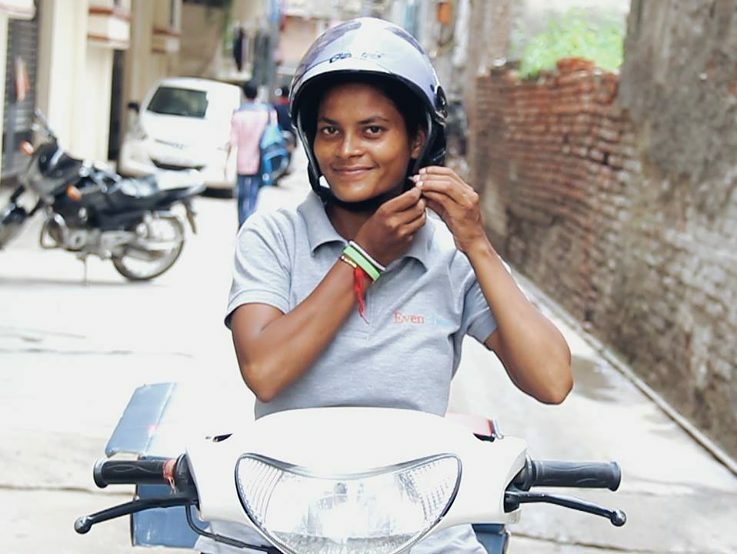 Halfway through her Bachelor’s of Arts degree at a Delhi college, Sunita’s scooter-riding work starts after the final class bell. When Sunita first started going out for deliveries, she was nervous about riding around by herself. “Now I’m much more confidently, that fear is gone,” she tells me, laughing about how she now rides across the entire city with no problems. 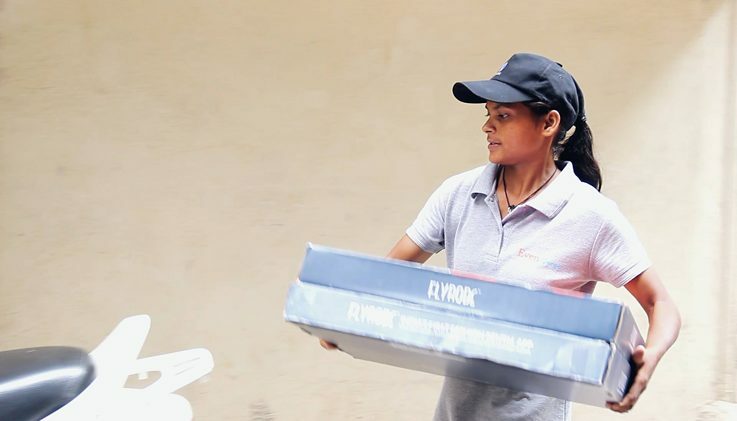 She is one of a large group of delivery girls permanently employed by Even Cargo, a startup founded by 28-year-old TISS graduate Yogesh Kumar in an attempt to tackle gender inequality. Each scooter-riding girl earns a monthly salary of Rs. 10,000 and together, the six of them complete between thirteen to fifteen deliveries in a single day. Once she got on a scooter and started delivering products, Sunita tells me that her parents gained more confidence about her safety. They began to give her more freedom, especially the liberty of travelling alone (in a country where restrictions on the mobility of women by patriarchal structures is often a reality). “Women in this country don't have access to public spaces, it's a fundamental flaw that we must address,” Kumar says, explaining the cause behind his startup. All of Even Cargo’s delivery girls are between 19 to 24 years of age and come from financially marginalized backgrounds. Yogesh's first task? Teaching them how to ride a bike. When launched, his startup trained 100 women in collaboration with the Delhi Traffic Police and Honda, the Japanese motor company which donated scooters and training time as a part of its corporate social responsibility. Of the 100 women to undergo bike-riding training, only about 10% completed all four steps and joined as permanent employees. This high dropout rate he blames on factors like families disapproving, marriage and lack of support, "Some women’s families don’t approve so they dropped out, others got married or didn’t have the support to complete the training and work independently." He adds that this is a prejudice he's fighting one delivery girl at a time. Dedicated to the cause of gender equality, Even Cargo wasn't Yogesh's first attempt at entrepreneurship in this space. A year before starting this venture, he attempted to set up an all-woman chauffeured taxi service, which didn't go as planned. "I tried a startup for a cab service with female drivers, but it was difficult getting the cars signed up. Many cab owners and motor companies didn't trust women as drivers, so they wouldn't lease them out, and buying cabs required too much capital. We faced a lot of challenges and fell flat on our faces. Then we shifted the model to a delivery service one," Yogesh explains. Even Cargo lends its delivery services to companies such as FlyRobe, Vajor and Clovia--all brands that sell women's fashion or accessories, so that the customers will primarily be women. These tie-ups were done keeping safety of the delivery girls in mind, when they go to customer’s houses. The initiative has been welcomed by women customers as well. “I feel safer because you know, every time there's a delivery and there's an unknown man on the other side of the door, you're apprehensive about who it could be,” explains Shambhavi, a consumer of the brand Vajore which acts as one of Even Cargo’s clients. Currently self-funded, this venture is on the look out to raise funds so that it can expand and bring more girls on board. And it's also helping these delivery girls explore more horizons, as Sunita adds, "I'm hoping to join the National Cadet Corps. I want to do something more with my life." The glass ceiling in India's male-dominated sectors isn't an easy one to shatter. Shalini Sinha, India Country Representative of WIEGO, a global organisation for informal women employees, shares, "For women to enter and truly thrive in male-dominated sectors, they have to become stakeholders. The shift has to be bottom-up, where women themselves organise at a ground-level and own, run and work in enterprises in these sectors." She adds that another challenge is the lack of city planners catering to the needs of India's working women, in terms of public transport being made safer for women, sanitation facilities and social security. Still, some start-ups are attempting to make a crack in the glass ceiling. Bangalore-based startup Jugnoo has also put delivery girls on the map, attempting to bridge the gender divide in this sector. Apart from logistics, the fight for gender equality in male-dominated spaces has also extended to the transport sector. Fleets of pink bike-taxis of startups such as Bikxie Pink and Baxi, employ women riders to ferry customers up and down the streets of Gurgaon and Delhi. Not to mention companies such as SheTaxi and WomenCabs that are also putting women behind the wheel, in the driver's seat.